Keeper by Kathi Appelt. (Grades 4-7.) Atheneum, May 2010. Reviewed from ARC provided by publisher. It was supposed to be the perfect day, this blue moon magic day. Signe was making blue moon gumbo with the crabs Dogie had caught fresh that morning. Dogie was going to sing his two-word song to Signe (finally!). And Mr. Beauchamp's night-blooming cyrus was going to open its blossoms. But then everything got messed up. But she has a plan to make it right. She's going to steal out to the sandbar in the middle of the night and find her mermaid mama. Her mermaid mama whom Keeper hasn't seen since she was three. Her mermaid mama will tell her what to do to make it right. Oh, Kathi Appelt. She did good. She really had me. She drew me in to this fantastical little family out on Oyster Ridge Road on the Texas shore and made me feel like they were real. Her short chapters kept me turning the pages. And just when I thought the story was losing its way, just when I was a little bit frustrated, I went ahead and finished the book, only to discover that her writing is like the ocean. The entire book, from Keeper's preoccupation with mermaids to Dogie's surf shop to the chattering seagull who loves watermelon... It's all an homage to the sea. And the writing is just another part of that. It gives and it takes. It swirls around in eddies a little bit. It swells like the tide. And it brings you in safe on the sand. All that's to say that while I was reading, I felt like the story was dragging a bit in places. But when I finished, I was able to step back and appreciate the beauty of the writing. It's not going to be for everyone, but those readers who can appreciate it for what it is will find a truly special story. Keeper is due on shelves May 4. *It is lucky I am not a professional reviewer because they would probably fire me. I loved THE UNDERNEATH and am looking forward to reading this one as well. I also enjoyed your review-- It nicely accompanies my nomadic brain! Do you love working in a library? I keep hoping a media specialist opportunity will open up at my school, but that blasted "B" word (..budget..aaahh!!) is holding me at bay. This was the first of her books that I read and I too wondered at times. 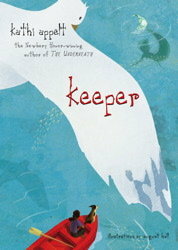 When done though I too realized the story carried me along much like the sea carried Keeper.